Help us plan #CripTheVote activities for 2019 by taking this brief survey. You can also click here for a text only version of the survey you can download, complete, and email back to us at: CripTheVote@gmail.com. This essay is part of a partnership between #CripTheVote and Rooted In Rights. The opinions expressed are solely those of the author. 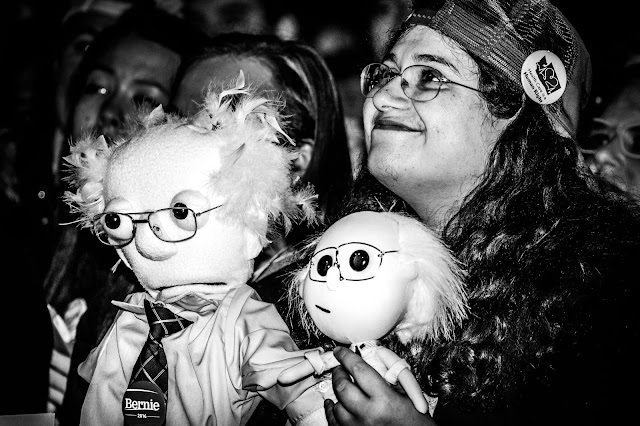 My first memories of being interested in politics were in eighth grade, when we learned about political theory. I remember being fascinated about how democracy could morph into authoritarianism. By the time I had completed one semester of high school, I had perused political philosophy. Plato was a personal favorite, and I found myself gravitating toward conservative ideas - especially on matters like abortion and other cultural issues. During my sophomore, junior, and senior years, I volunteered on political campaigns, from the state legislature to the US Congress, and even ventured to Washington, DC for a couple of educational programs. However, it wasn’t until I identified as a disabled person that my worldview began to crystallize. For most of high school, political issues were mere abstractions. I grew up in a wealthy suburb of Seattle, so my food, shelter, and college education were not in question. Before I was an adult with diagnosed disabilities, I had little awareness of healthcare, the economy, and our social safety net. In short, living in wealthy suburbia culminated in privilege, as well as obliviousness to the political and economic realities so many people face. While I was taking summer courses in between my freshman and sophomore years of college, everything changed. Attending Wellesley, I had hoped to major in Classical Studies and Philosophy, and to do graduate work in either politics or history. From my nineteen-year-old vantage point, my life’s story would inevitably culminate in a PhD and a job somewhere in academia. However, driven by stress, biological factors, and ill-advised medication given by my neurologist, I suffered a breakdown, which culminated in mood dysregulation, panic disorder, and PTSD. During my three-and-a-half-week hospitalization, I started seeing the first signs of what would become nearly a decade and a half of disability. Only a few weeks after my hospitalization, my family received its first bills for my medical care back in Boston. I quickly learned that I was lucky that my Dad had taken out a policy for me through Wellesley that had covered mental health, because our Washington State-based Regence insurance didn’t afford the same protections. As a result, my family and I averted a $30,000+ hospital bill. No longer was the issue of healthcare merely an abstraction; no longer were prescription drug costs something that only my elders had to face. Now, as a person whose disabilities required medication for the rest of her life, issues I once took for granted were now a matter of life vs. death, poverty vs. sustenance. As my family paid more and more for my medical bills, totalling well over $400,000 in fourteen years, I came to the realization that affordable, accessible healthcare was a preeminent disability right. My healthcare justice activism was ultimately motivated by the cementing of my identity as a disabled American. In 2014, I was officially approved for Social Security Disability. Seeing how much Medicare and low income subsidies I personally qualified for under Part D benefited my life, I actively advocated for the policy for all Americans. Thus, it should come as no surprise that I spent the better part of a year volunteering for Bernie Sanders’s Presidential campaign, being a delegate to the Washington State Democratic Convention, and serving as First Vice Chair of the Washington State Democrats Disabilities Issues Caucus. In all of my activism, some of which garnered press coverage, I emphasized the importance of single-payer healthcare for people with disabling, chronic health conditions, like myself. Although the primaries ended in a loss for my candidate, my personal journey in politics was just beginning. Inspired by the state’s caucus system and my own involvement in the electoral process, I delved full-speed ahead into the healthcare justice movement. In October of 2016, I joined Health Care For All - WA, where I now sit on the Political Action Committee. I also volunteered for a year as Steering Committee President, Events Committee Chair, and served a stint on the Board of Directors for Whole Washington, a well-intentioned, but poorly executed Washington State initiative campaign, to ensure healthcare for every man, woman, and child - regardless of ability or disability. The pinnacle of my political involvement came in January of 2018, when I testified before our state legislature’s health committee on Senate Bill 5701, which would have established a single-payer system in Washington State. Although I had only a minute to speak, I emphasized the bill’s positive impact on disabled people struggling to find insurance, and also recounted my personal story - one that included a private insurer’s chiding my family and me on a recorded line to go to the hospital, in lieu of covering my psychiatric medications on an outpatient basis. Equally powerful, I elucidated the harrowing reality that the only reason I was alive was because my parents could afford to pay for the best doctors and most cutting-edge treatments when I was a young adult, without which I may well have succumbed to suicide. I was later told that the friendly overflow crowd gave me thunderous applause in the hall. This chance to offer my voice and experience as a disabled person in service of actual policy was transformative for me, and inspires my efforts to continue advocating for the crucial disability right of ensuring quality, affordable healthcare for all. With our next national election coming up quickly, I have had plenty of time to reflect on my political journey - from being raised by a liberal mom and a center-left dad, to becoming a young conservative, to ultimately arriving at progressivism in my late twenties. I realize that with different formative experiences, my beliefs and values would have been far different. Thus, even though advocating for a healthcare system abolishing private insurance companies culminates in my voting for left-leaning politicians, another person with a disability might see the same issue from a polar opposite perspective. As someone who values freedom of conscience, I would urge everyone to be true to his or her value system when voting - regardless of how the media frames the issues, regardless of how one’s family has voted in the past, and regardless of how one has cast ballots in earlier years. In short, I haven’t always voted for the same party or the same issues, and I see nothing wrong with changes in worldview as one evolves as a person and member of society. Each time we cast a ballot, we make a statement about how we believe our government and a just society should function, and about which candidates are the best to carry out these ideological commitments. It is all of our jobs as people with disabilities to ensure that government both reflects and acts upon our concerns, however diverse they may be. This election season, exercise your right to vote, urge your friends and family members to do the same, and may the candidates and initiatives best for disability issues prevail. Leslie A. Zukor is a disability rights activist, who serves as First Vice Chair of the Washington State Democrats Disabilities Issues Caucus, and is the Secretary of the Washington State Political Items Collectors. She also is a member of Health Care For All - WA, and serves on its Political Action Committee. Holding a bachelor of arts in Anthropology from Reed College, Leslie transferred from Wellesley College and went to school in Oregon part-time for five years, before she earned her degree. Her interests include political history, photography, and collecting liberal, progressive, and Leftist political memorabilia. You may follow her on her personal Facebook page @facebook.com/lazukor. 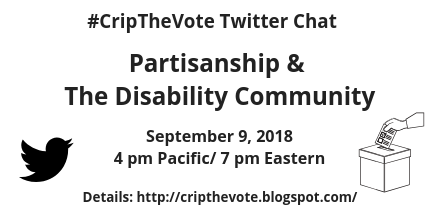 Election Day is in 2 weeks away and #CripTheVote is thrilled to have guest hosts Sarah Blahovec and Sarah Funes, two disability activists involved with community organizing and get-out-the-vote efforts for the disability community, join us for a discussion on voter outreach and mobilization. Follow @GreggBeratan @AndrewPulrang @DisVisibility @SarahFunes. When it’s time for the chat, search #CripTheVote on Twitter for the series of live tweets under the ‘Latest’ tab for the full conversation. Welcome to the #CripTheVote chat on voter mobilization and outreach with guest hosts @Sblahov & @SarahFunes! We look forward to hearing about what is happening your community. 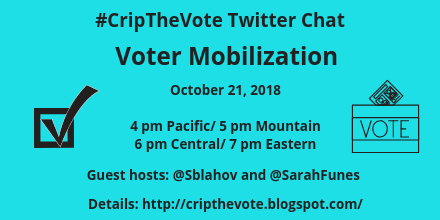 This concludes our #CripTheVote chat on voter mobilization and outreach! Thank you to everyone for joining us today, especially our guest hosts @Sblahov & @SarahFunes. Over the last two years, for good reasons, #CripTheVote has mostly focused on disability issues at the national level on the U.S. Presidency and Congress as have similar efforts in other countries like #CripTheVoteUK. But a lot happens in states, counties, cities, and towns that directly and immediately affect disabled people’s lives. Tomorrow’s members of Congress, cabinet secretaries, and presidents often start out as today’s village board members, city councilors, state legislators, and governors. In this chat we will explore state and local government, and how the growing disability community is doing in these important but often overlooked arenas. Politically our country is deeply polarized. The evidence we have seen of the voting patterns of the Disability Community would seem to indicate that our voting falls along the same patterns as the country as a whole. A number of projects have worked to develop the electoral power of the Disability Community by portraying us as a potential voting bloc. In this chat we would like to explore the role of partisanship in expanding or limiting our community’s voice in the political sphere. Q2: Do you identify as a person whose political beliefs are partisan? If so, why? #CripTheVote is once again gearing up for major elections, the 2018 Midterms. On November 6, voters will choose candidates for all 435 seats in the U.S.House of Representatives and 35 of the 100 seats in the Senate. In addition, 34 states will elect governors, and literally thousands of local and municipal offices will be up for election. 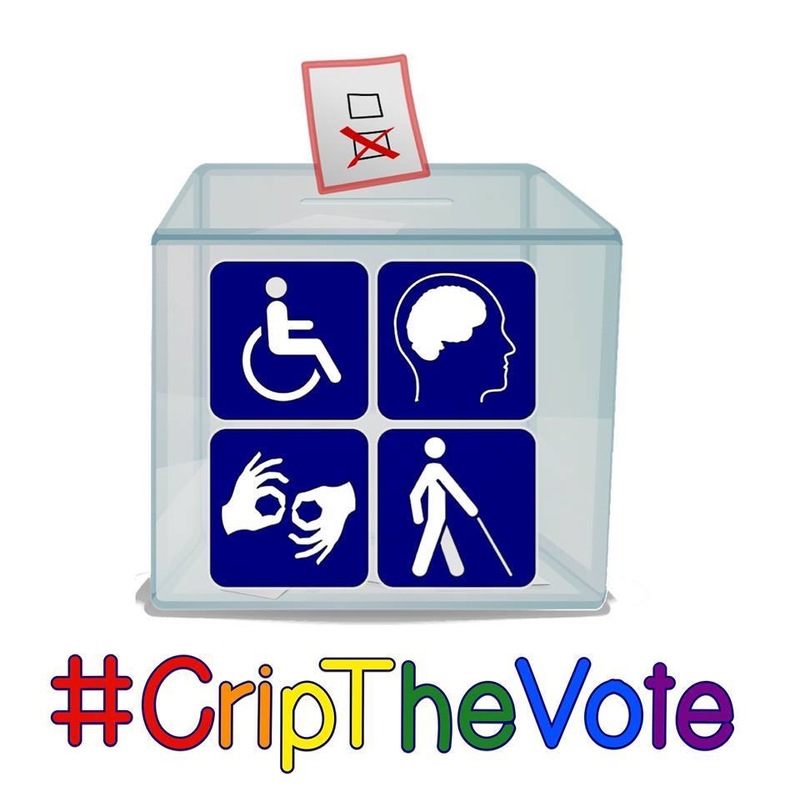 #CripTheVote has held periodic topical chats and hosted ongoing conversations on disability in electoral politics since January, 2016. 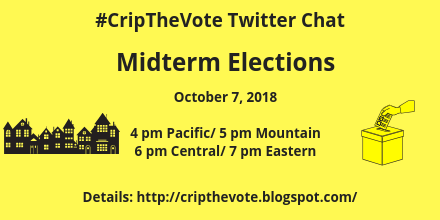 In the run-up to the 2018 Midterms, #CripTheVote will host the following chats, and live tweet the results on election day. Times, guest hosts, and questions will be announced. How state and local elections and elected officials impact disability policy, and which disability issues are especially relevant to local elections. An overview of the most active and urgent disability issues in this year’s Midterm Elections. What prevents disabled people from voting, and how can we “get out the vote” among eligible disabled voters? Join us as we share our voting stories, watch the results come in, and process the outcomes. Exploring the multiple ways that hunger and disability are interrelated. Discussing how poverty is understood and talked about in multiple contexts, and how this relates to the disability community. 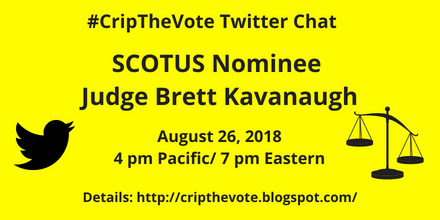 Join #CripTheVote for this discussion about the nominee to the Supreme Court of the United States (SCOTUS), Judge Brett Kavanaugh. Before the hearing for Judge Kavanaugh starts on September 4th, we will discuss what this nomination will mean for the disability community and the nominee’s record on civil rights and other important issues. Welcome to the #CripTheVote chat on #SCOTUS nominees and Judge Brett Kavanaugh. FYI, throughout the chat SCOTUS refers to the Supreme Court of the United States. Content warnings: abortion, bodily autonomy, medical coercion, forced treatment, forced surgery. Please feel free to mute or take a break from this chat if needed. Q8 What can individuals do to voice their opinions about Kavanaugh or any #SCOTUS nominee? With less than three months until the Midterm Election on November 6, now is the time for disabled voters to take the #CripTheVote Challenge. Pick three disability issues you care about most, and ask candidates about them. 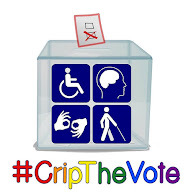 We invite #CripTheVote readers, participants, and friends to make this a group effort. First, choose your three issues and compose a tweet for them. 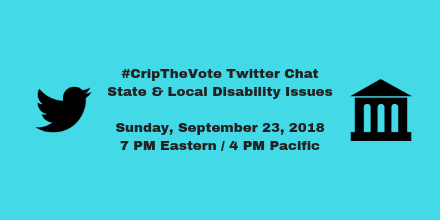 Don't forget to include the #CripTheVote hashtag in your tweets so your questions and replies become part of the larger conversation. 1. Would you include coverage for home care in any #Medicare4All bill you would support? 2. Do you support ending subminimum wage for disabled workers? 3. Do you support the Disability Integration Act #DIAtoday? Or, you can do one tweet per question if there's more you need to say about each one. Next, ask candidates in your areas the three questions you have developed. Again, use Twitter and the #CripTheVote hashtag so everyone can see the impact we are having, and also see any candidate responses you get. Of course you can also ask your questions in other ways: personally at campaign events, comment sections on candidate websites, on other social media like Facebook and Tumblr, Letters to the Editor of local newspapers, and direct letters to candidates. Adding other, related movement hashtags to your tweets can also help introduce others to disability issues. Don’t let candidates get through the campaign without addressing disability issues. Join the #CripTheVote Challenge!